Portuguese-Turkish rabbi and physician; born in Portugal in the second half of the fifteenth century;died in Constantinople between 1534 and 1542. His father, David b. Solomon (d. Constantinople, 1504), one of the most prominent members of the great Yaḥya family, fled from Portugal to Naples in 1493, and thence went to Constantinople about 1497. Tam, who accompanied his father on both journeys, was recognized as a Talmudical authority, and presumably he succeeded Elijah Mizraḥi as rabbi of the Turkish capital. It is stated that he was the body-physician of Sultan Sulaiman and a renowned authority on Mohammedan law, but there is reason to believe that his admirers exaggerated his importance. Tam's 213 responsa, which, under the name "Ohole Tam," form a part of "Tummat Yesharim" (edited by Benjamin b. Abraham Motal, Venice, 1622), constitute all that has been preserved of his writings. The preface to "Yosippon," attributed to him and first published in the Constantinople edition of 1510, is really the work of Judah Leon b. Moses Mosconi (see Jew. Encyc. vii. 260, s.v. Joseph ben Gorion). 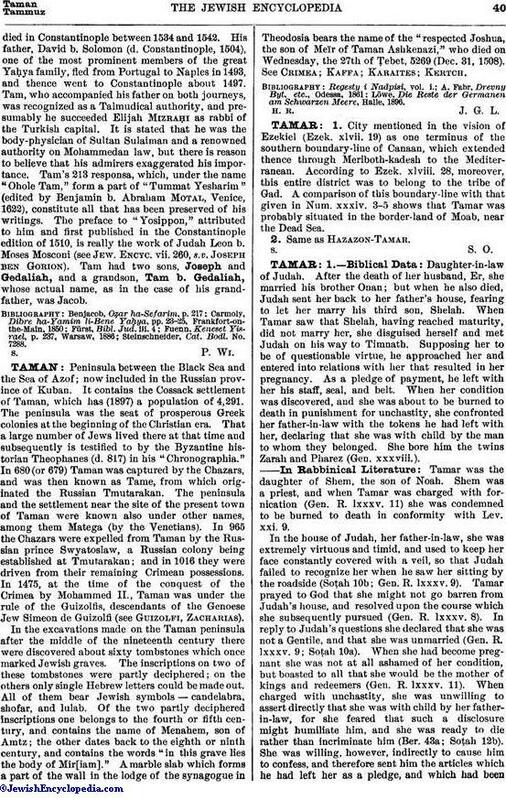 Tam had two sons, Joseph and Gedaliah, and a grandson, Tam b. Gedaliah, whose actual name, as in the case of his grandfather, was Jacob. Steinschneider, Cat. Bodl. No. 7288.